I was feeling a little blue with all of the white stuff outside so I thought I'd opt for something bright. I rummaged around my polish collection until I found the brightest pink I had. Imagine my delight when I saw it was called Bermuda Shorts. Here it is: Essie's Bermuda Shorts next to OPI's Divine Swine. The Essie polish is actually a matte. Without a topcoat it's much darker and doesn't wear well (you've been warned). When I added Divine Swine for the accent finger, I just about died. 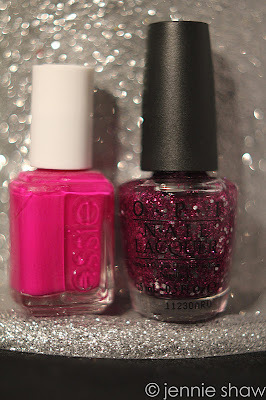 The teeny purple sparkles give off a sugar-plumb sheen, taking the pink to the next level. So obviously, I couldn't resist going back and doing all of them. I feel just like Jem! Truly Outrageous! Hop on over to see Tara or Vicki to link up and show off what you're rocking! Love these nail polish colors! Looks great! I definitely would have done all my nails once I saw the accent nail too. I love the chunky glitter and I about died when you said you had to go back and paint the others with glitter too! Truly, truly, truly outrageous. Whoooaaah, Jem! oh my! i LOVE the glitter nail polish! I have Divine Swine, but haven't used it yet. Now you've got me really excited to try it. I love that you went with full-on glitter. It is very Jem and it looks great! rockin the hot pink! love!! Wow just gorgeous- that pink is just the right shade and the sparkles are beautiful- the one nail effect looks great too! Your nails are a great shape- I can never file mine like that. Ohhh! Love the Bermuda - very pretty dark pink. And the Divine Swine is gorgeous. I got it for one of my friends for a VDay swap.